When we decided to head up north, way back in Astrakhan, Russia, we had a few waypoints in mind that we definitely did not want to miss. Nordkapp was an obvious one, but we also have a couple of friends who bailed out on the rat race in Belgium to go and live the good life in Sweden. So after making our way down along the Norwegian coast, we went east towards Sweden in a more or less straight line, bypassing Oslo. 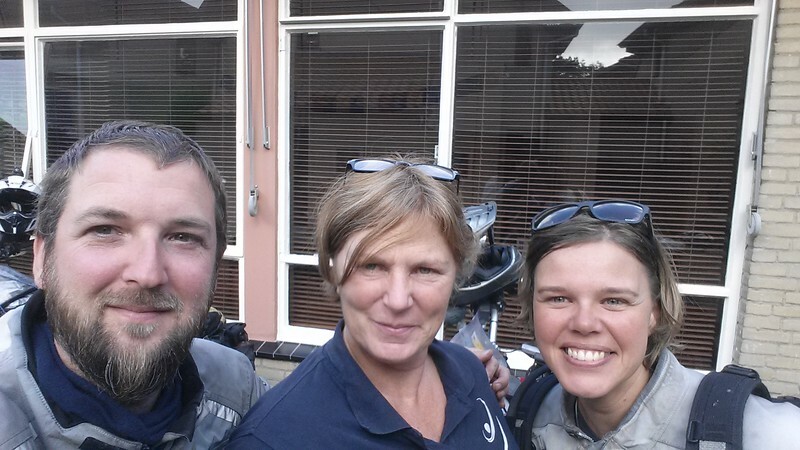 Our Belgian friends, Kris and Els live in Kil, near Karlstad. It’s a beautiful region with endless forests, dotted with lakes. When we got in touch to say we were in the neighbourhood, they welcomed us with open arms. Crossing into Sweden, we tried to avoid the main roads, allowing us to explore some incredibly nice and deserted gravel roads. It is obvious why they decided to move to Sweden. Compared to busy Belgium, this really is the quiet life. 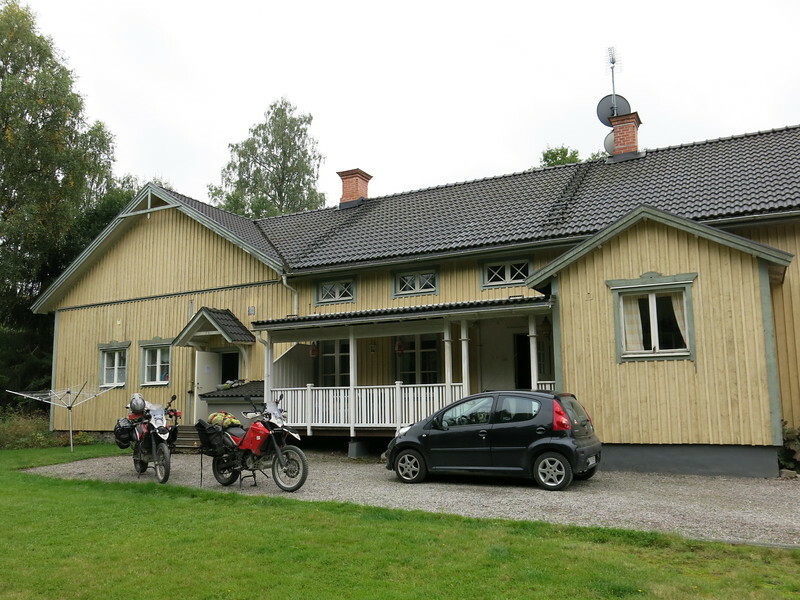 Kris and Els moved to Sweden to try their hand at running a B&B, which means that after weeks of camping, we finally get to sleep in a nice warm bed for a change. Even better, we do not have to cook! Kris’ brother has come over for the Summer holidays and we are invited to join them for dinner. 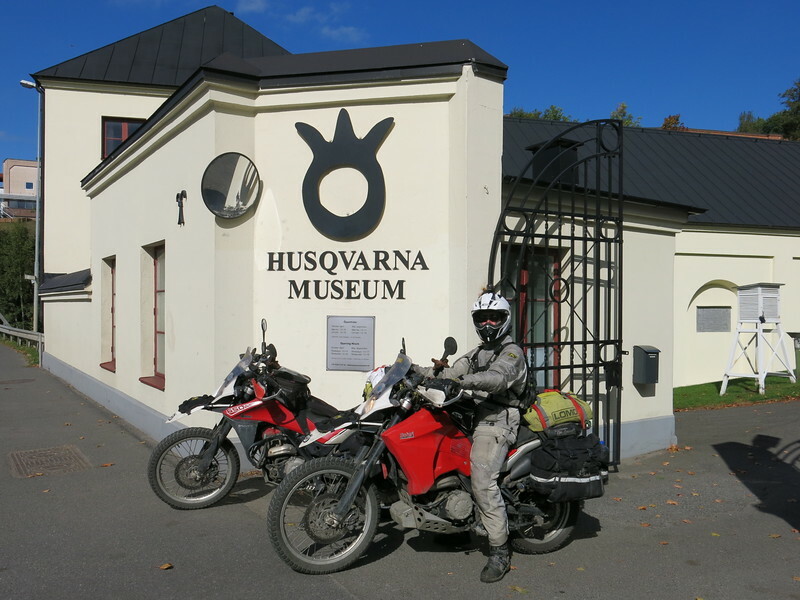 Since we are in Sweden, there’s another landmark we definitely shouldn’t skip: the Husqvarna factory museum in Huskvarna. 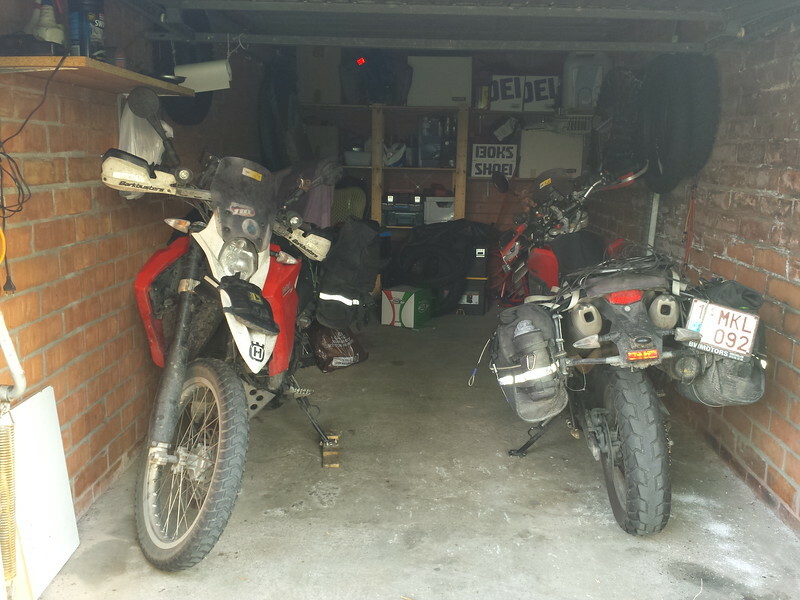 We have lived through so many adventures on our bikes, we’d love to see where their roots lie. Riding through those gates felt kind of special, even though flashing my key at the ticket officer did not earn us a discount. 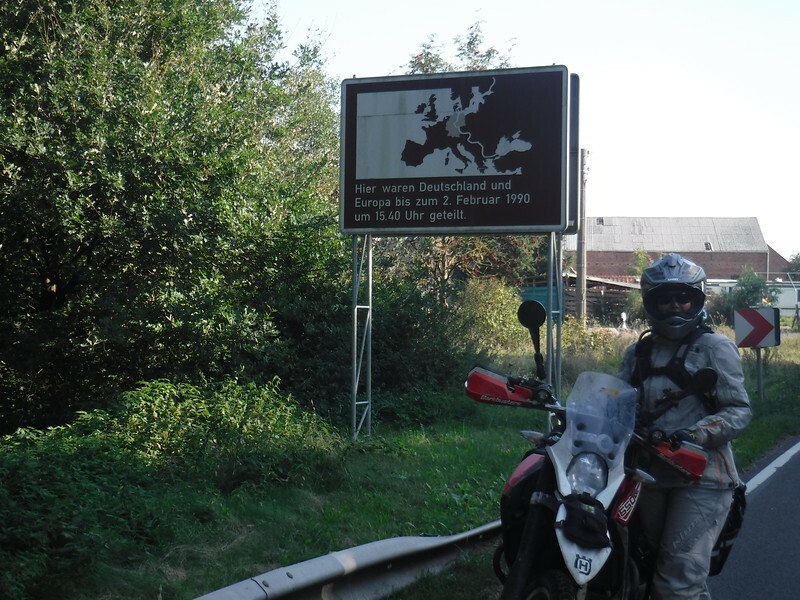 Riding a Husqvarna from Belgium to Sweden via Iran and Russia did not impress the guy. Oh well, the museum was well worth the buck. We spent the better part of the day marveling over everything that ever came out of this factory. Husqvarna is best known for the motorbikes, chain saws, lawnmowers and sewing machines. But they actually started out producing weapons for the Swedish army and since they had to become experts in casting iron for those, they applied that to pretty much anything imaginable from meat grinders to stoves. In the 60’s they even tried their hand at domestic appliances like microwaves, but it turns out that they were too far ahead of their time. It didn’t become a big sales success. We make our way down through Sweden over the next couple of days. 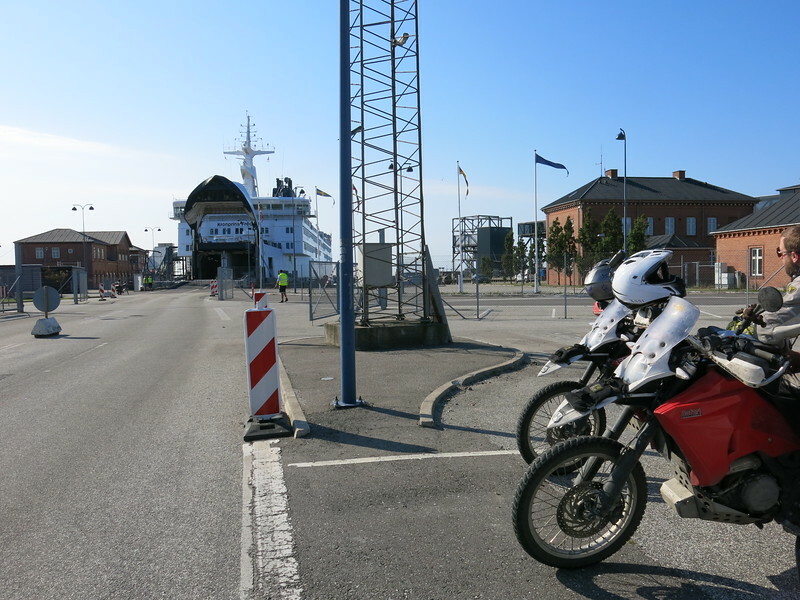 Looking at possible routes, we opted to take the ferry in Denmark towards Rostock, Germany. The ride south is quite uneventful. 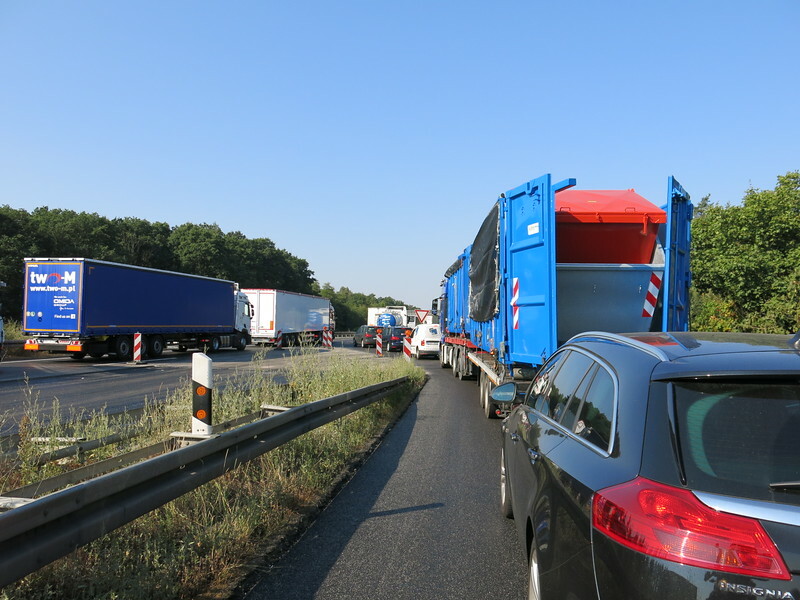 Crossing the border into Denmark is a small, albeit rather expensive, adventure. 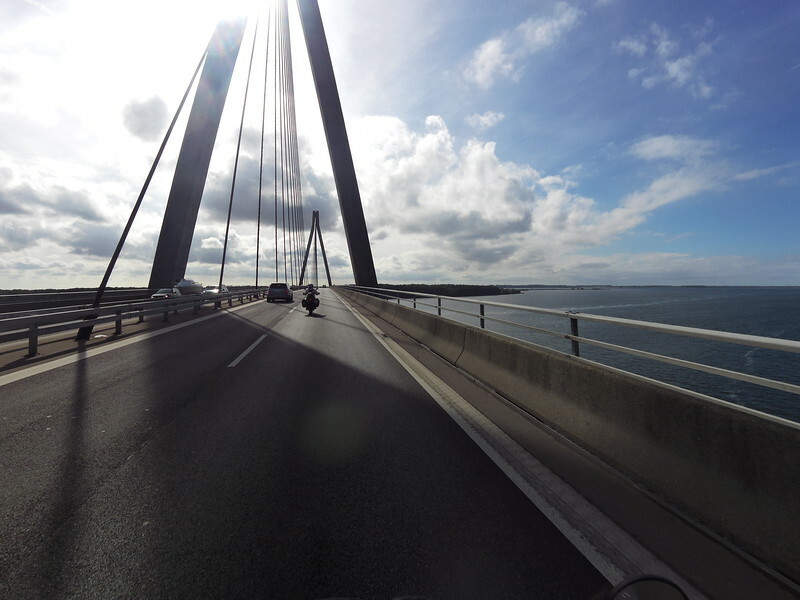 Riding through Denmark is even more uneventful. It’s flat, quite busy and not the most exciting ride. We find a campspot just a few kilometers from the ferryport, so we can get there nice and early for the next ferry out in the morning. Another expensive border crossing. We still have a couple of days before we are expected home and even though we’re literally on the last straight, we don’t really feel like crossing that finish line just yet. So we take it slow and wind our way through this part of Germany we haven’t visited before. In fact it’s our first time in what used to be the DDR. Only a couple of weeks before they had local elections in the area and the posters we pass in some of the villages do more than just raise our eyebrows. Slogans like ‘Heimat braucht Kinder, kein Homo Ehe’ (The motherland needs children, no gay marriages) are just leaving us speechless. This is the society we are coming home to and it’s a bit of a cold shower after all the warm and loving people we have met along the way. The first time we ‘accidentally’ end up on the highway, we get stuck in traffic. Another nice welcome to Western Europe. The weather is still pleasant and warm though, especially after the colder temperatures we had up north. We decide to take some time off in the Moselle region. One final mini holiday in the trip before we dive back into everyday life. Although, with everything we have experienced and all the things we have learned about ourselves and each other, that rat race will never be the same again. Our final night on the road, we drop by Mirjam near Breda. It’s so nice to see her again and hear about all her adventures. After our ways parted in Iran, she traveled for the most part alone through Turkmenistan, Uzbekistan and Tajikistan. 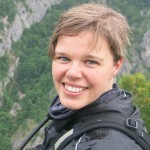 Her trip was cut short after braking her leg in Kyrgyzstan, and was flown back to Holland to have surgery. We are in awe at the way she handles this. Compared to these stories, our ‘adventures’ seem so small. This is one tough lady! And then the final day arrives. The home straight. It feels surreal, riding back on familiar roads. It does not feel like it’s been five months, but more like 2 or 3 weeks. My parents have been following our every move through the Spot tracker for the past 2 days (actually we found out later that they have been doing the same for the entire 5 months) and they know exactly what time we will be arriving. They are waiting for us when we turn into the street and it’s an incredible feeling to see and hug them again. We haven’t felt homesick for a second and we did not miss anything from our life back home, except for our family and friends. And even they were with us almost every day. They had our backs when we were in trouble and they were enjoying the ride with us when things went well. So a big thank you is in order! You know who you are!